Mississippi Roll (2018. 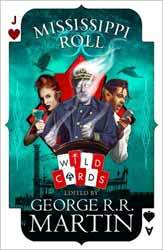 320 pages) is another in the series of ‘Wild Card’ novels, edited by George R. R. Martin and assisted by Melinda M. Snodgrass. Martin is presently developing the expanding universe for television. This is the twenty-forth book in the series. If you haven’t caught up with the series the basic premise is that an alien virus has hit the world. While many died, some were spared and of those survivors, a large proportion transformed. Some gained extraordinary useful powers, like flight, while others were twisted and deformed, gaining little that was of use. The first group are known as ‘aces’, the latter ‘jokers’. This basic idea of a world which has been dramatically changed has allowed a large cast of writers to place their personal stamp, allowing them to tell a wide range of stories. This novel was written by Stephen Leigh, David D. Levine, John Jos. Miller, Kevin Andrew Murphy, Cherie Priest and Carrie Vaughn. The interesting thing about the story is how well it hangs together. Considering it was written by committee. It is often difficult to distinguish between the writing styles of the various authors. The book is constructed in much the same way as others in this series. What you get is a collection of short stories which all bleed into one another and are held together by a central story. In this case the central story is that of Wilber Leathers, the once living Captain and owner of the steamboat, Natchez. When he gets into money problems he is confronted by Chambers. A fight ensues and Wilber kills Chambers, but not before Chambers is able to shoot him. For all his life Wilber was grateful that he and his wife had not been infected by the virus, but at the point of death Wilber turns into a diaphanous Will-o'-the-wisp creature that can only visually manifest when he is filled with steam. Worse still, when his wife leaves the boat, believing her husband dead, Wilber discovers that he is trapped on the boat, able to witness everything and interact with nothing. Wilber then becomes the POV character and the reader’s way of seeing much of what occurs on the boat. As the boat makes its final journey up the Mississippi, the other stories start to unfold. You get one about refugees, prejudice and how people can become to be seen as sub-human, always a precursor to detention without trial. There is an Agatha Christie murder mystery to uncover as well as character study of a ‘joker’ who really wants to be a hero. All of these tales wind around the boat, much as the river winds through the country. What is amazing is how cohesive the whole feels. Whereas many of the books have dealt with the superhero aspect of the ‘Wild Card’ virus, this is a wholly gentler affair. Wilber is a good central character, very empathetic. His power is next to useless and the sadness he feels at the loss of his wife is palpable. At no point do you feel that his story is just there for filler.